Many years ago, at the Printer's Row Book Fair, I stumbled upon this reproduction print. The scan doesn't cover the sides completely but you see most of this. 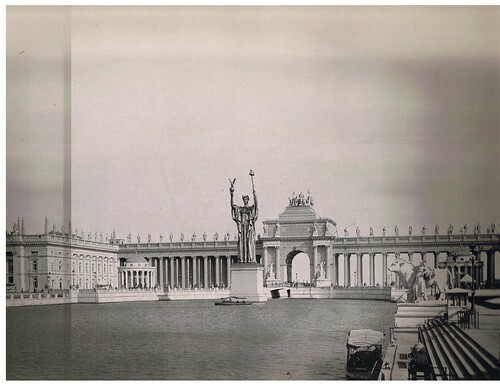 This print is of a photo of the Statue of the Republic and Peristyle which was in the Court of Honor at the World's Columbian Exposition held in Chicago beginning in May 1893, and running to October 1893. The fair was designed to honor Christopher Columbus' discovery of the Americas in 1492. Although the area where the fair was located was dedicated in 1892, due to construction and other issues, it wasn't opened until 1893. The fair is known for things like the forerunner to the zipper closure, Juicy Fruit Gum, Pabst Blue Ribbon Beer and spray painting. Frederick Law Olmstead, America's premier landscape architect at the time, designed the 650 acres which encompassed the park. Over 700,000 people attended the fair and marveled at things like the fully electric kitchen and the world's first Ferris Wheel. That particular ride was moved north to Lincoln Park and then to the St. Louis World's Fair. After that fair, it was destroyed. Chicago received benefits such as the land where the fair was becoming Jackson Park. The Museum of Science and Industry, one of the crown jewels of Chicago museums was, originally, The Palace of Fine Arts. The Museum gives guided tours of its building detailing its original role in the fair and the innovations which came from this event. One of the most visible remnants of the fair can be found at Hayes Drive. I have long admired this statue. If you notice, it bears a startling similarity to the statue at the exposition. It's supposed to. Daniel Chester French, an extremely prolific American sculptor, designed and built the original statue. The original statue at the exposition was 65 feet tall and was at the eastern edge of the fair, facing west. The current statue faces east. A pier, located behind the original, was a point of entry for many visitors. They "rode" to the fair entry, located under the arch in the top photo, on a moving sidewalk, the first of its kind. Most of the buildings at the fair were constructed with plywood and a building material called "staff", made of plaster of paris and hemp, insulated with straw. The walls were then whitewashed which gave the exposition the nickname "The White City". When the exposition was over, the buildings were torched. It was a great event in Chicago and people came from all over to watch the city within a city burn to the ground. The statue was dismantled. The statue was supposed to represent the resilience and strength of a country that had come through a Civil War. Plus, immigrants from all over the world, were flocking to the open arms of the US. Six years previous to the fair, the Statue of Liberty had been dedicated in New York. You can see the influence of that statue in French's design. In May of 1918, on the 40th anniversary of the fair and the 100th anniversary of Illinois becoming a state, this statue was unveiled. It's 24 feet high, of gilded bronze, and stands on a specially built pedestal. French assisted Henry Bacon in reproducing his original design. French and Bacon went on to design the Lincoln Memorial. 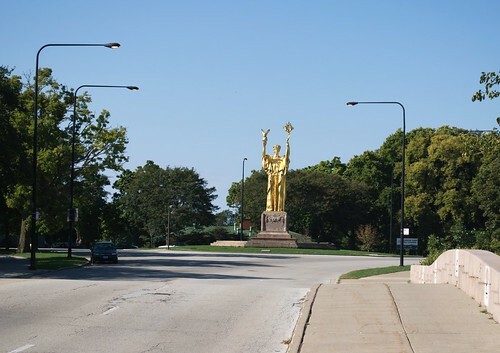 When I have to come to the south side of Chicago on business, I make sure my drive takes me by this statue. Chicago has a huge number of public statuary but this is my favorite. Even on overcast days, she gleams. I'm not sure what they do to keep her gilded but, whatever it is, it's a wonderful job. If you'd like to read more about this statue, go to this link. Another extremely good source of information about the exposition is Erik Larson's book, Devil in the White City. It's an extremely well-written and deeply researched story built around the fair. Some day, I hope to redo the room where the litter boxes are and this is one of the pieces I want to frame and put on the wall. Some day.